In honor of my recent cross-country move, I figured we should offer up a slice of Americana with a lesser-known Route 66 landmark: the Barstow Mall. Barstow is a notoriously isolated city located in the Mojave Desert, near where I-15, I-40, and CA-58 all converge. It’s also a spot along historic route 66, and as a result the main drag through town is packed with vintage neon hotels, many of which long ago ceased operations. Like many spots along Route 66, Barstow’s looking a little rough around the edges today. 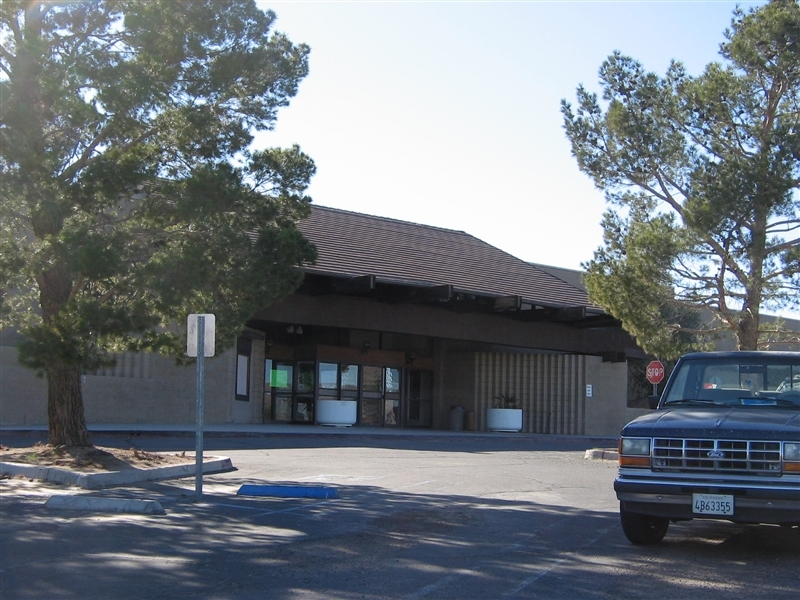 Historically a major transportation hub, Barstow is the home of a large rail classification yard and is known as a freeway crossroads where many trucks pass through, bringing goods to Los Angeles. Its desert climate is somewhat merciless with days in the summer regularly pushing the mercury above 100°F. Barstow’s geographic isolation and unfavorable climate are probably two reasons why it is today one of the ten poorest cities in California. 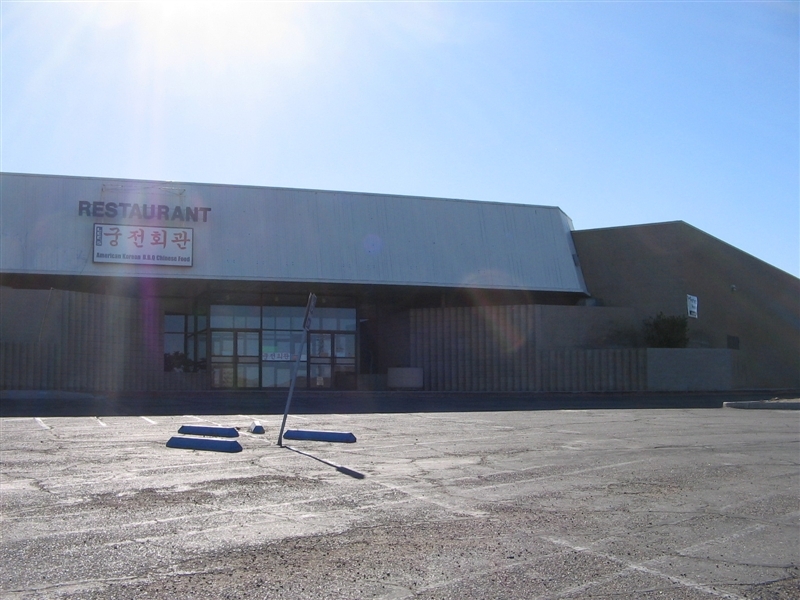 Barstow may be the home to many notable Route 66 landmarks, but the Barstow Mall is one you won’t normally hear about. A joyless concrete behemoth left over from the 1970s, this unloveable structure has been almost compeltely forgotten, with practically no stores or businesses left operating inside. 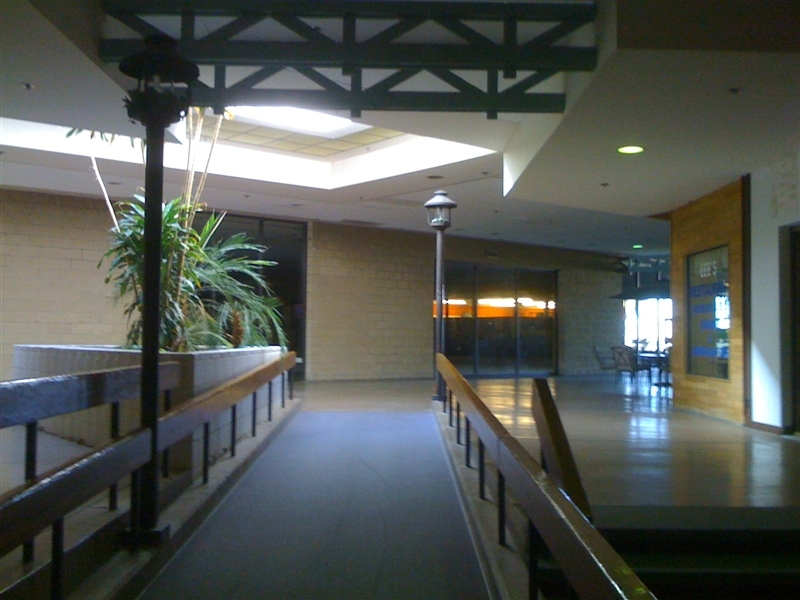 Fairly typical of “dumbell-style” two-anchor 1970s malls, Barstow Mall is notable because it has retained many of its original details in the form of planters, odd light fixtures, and a whooole lot of concrete. 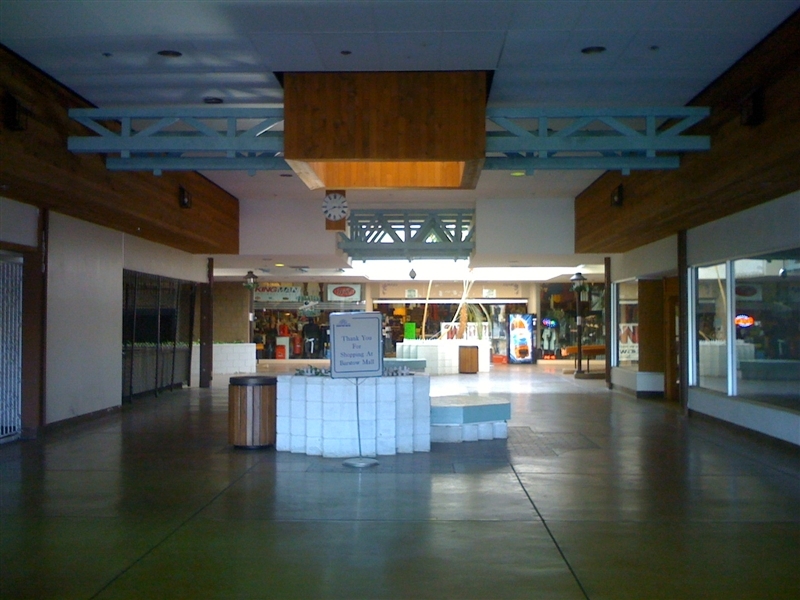 The mall’s two anchors, Sears and Kmart, left long ago. It’s a frankly spooky place. When I was there it was almost completely empty except for a bunch of teenaged girls with tiaras taking a group photo (?). Barstow in general was kind of a dramatically creepy place, with so many sad vestiges of the glory days of Route 66 and the area’s general lack of vegetation. Given the Barstow Mall’s proximity to major transportation corridors, however, and the fact that it’s such a ghost town, it’s well worth seeing on a swing through town. To have the bulding still open despite it having nothing within that would be worth keeping it open is amazing in itself. 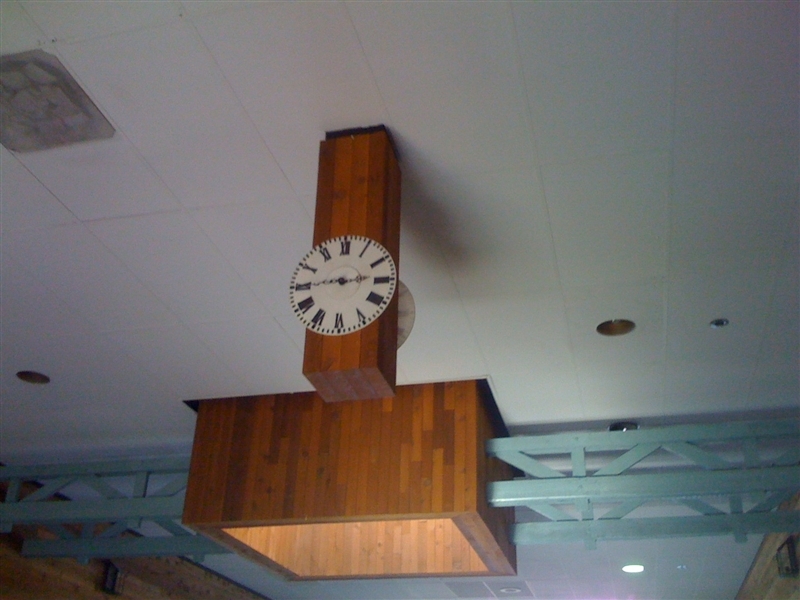 The wood accents clearly put the mall back in the 1970s. That was one of the first things that jumped out at me. Something must have replaced this mall, but what? The Other Dubya? Hooray, you answered my request! A bit ironic that there’s a store called Phantom Sports. Actually, it likely closed down years ago. Are there any stores left? There’s very few stores open. I think there was only 3 or 4… I remember one selling sports fan type stuff, and I want to say there was a tailor? What could have replaced the mall? I’ll be wagering bets that there’s big-box retail near one of the interstates that surrounds the town. I think this mall had a Big Lots at one point too. Any idea where it was? @Bobby, I’m going to guess the Kmart was later Big Lots. A 1970s Kmart in my city closed in the 1994 closures and was later Big Lots between 1998-2005. Barstow Mall would be perfect for eccentric specialty retailers such as Vacuum City and Grandma World Apparel. I remember when the mall opened. It was great to finally have a mall in town. I go back to Barstow every year or so to visit family. The last time I drove by, there was a Korean BBQ in the mall. Thought that was an odd place for a BBQ joint…especially a Korean one. But considering the proximity to the I-40/I-15 interchange and the amount of LA tour buses heading to Las Vegas, it seemed at least understandable. The mall was done in by a two large outlet malls that opened a few miles up I-15 at the Lenwood Rd. exit. One is called Factory Merchants (much of it closed now) and the Tanger outlet, which is doing very good business. 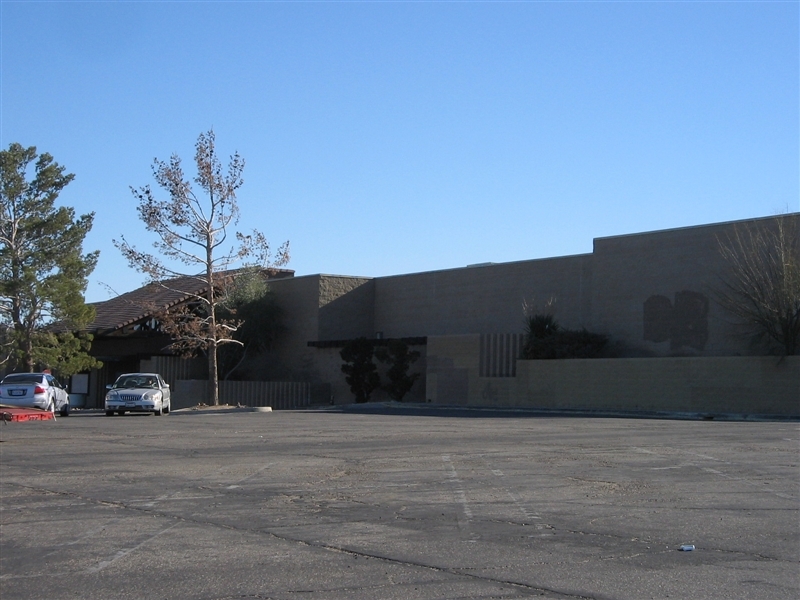 The Barstow mall was also located at a site where expansion, unless done upward, is extremely limited. A mall… in Barstow? Who knew? Is this mall still there? I’d love to take a visit and jump back into the 70’s for an afternoon. Cool stuff. Lov the creepyness. You bet it is. These photos were all taken in February 2008. 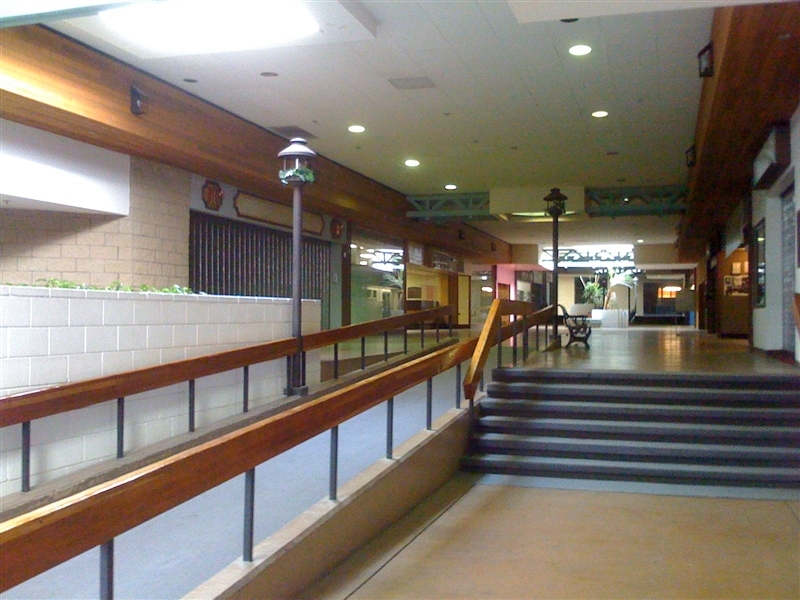 I’d like to write a screenplay for a movie taking place in a mall in the 1970’s, and shoot in here. It would require some kind of budget to make the mall look occupied though. Maybe we could drive a car through it like the Dixie Hills Mall in the Blues Brothers? Thanks for posting these pics. I was wondering about this mall when I drove past it last summer. Kind of a spooky looking place. 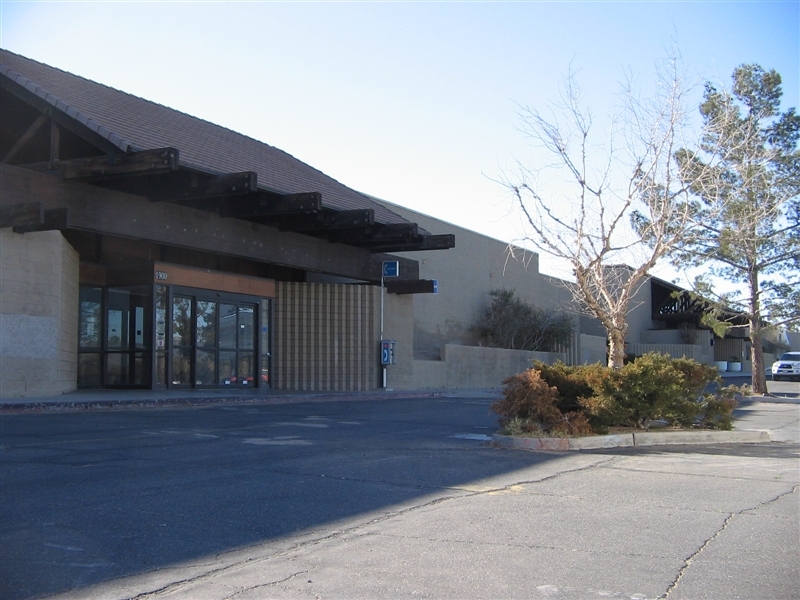 the victorville mall open 20 mins away,a mall that had all the modern stores of valley malls and a movie theater and real food court.this hurt the mall.the first big hurt actually was when kmart moved from the barstow mall to a full size version off barstow rd. (which later closed because they couldn’t compete with walmart when they came into town and now that building is a junky indoor swapmeet.) so with the lost of the barstow malls oldest anchor store that left sears and rudes to anchor the mall. rudes dept store went out of business and left just sears. the sq footage of these malls was limited so the kmart and sears was scaled down and was limited in their supply or offerings. well victorville had a full size sears not to far away. (20 mins in most decent size cities isn’t considered going out of town its just going across town)so sears left too. as for he big lots well they entered the mall way after everyone left but only opened with the conditon that they wouldnt have to have a inside opening to the mall.so they were not connected to the mall, you had to go outside to enter. well this version of this store was also a lil smaller than the typical big lots. that store also failed and left.seems that everytime someone builds in barstow they build a scaled down version of their store and dont offer everything that they normally would anywhere else.this is the prob with the new home depot. people what happens when u go to a store and almost everytime u go they dont have what u need but can order it from its store in victorville? u just cut out the middle man and shop in victorville.a mall full of mom and pop stores that cant compete with chain store prices cant survive especially when ur mom and pop hours change when ever u feel like taking time off. I remember this mall very well from when I was a kid. The Big Lots was in the old Sears on the east end. The last stores to leave were Claire’s and Millers Outpost. I remember shopping at them until at least 1997. There was also a Wherehouse music store, an arcade, KB Toys, some store called Peties (sp? ), Walden Books, Lens Crafters, and a photographer. There was no real food court, though I do remember a hot dog stand by the K-Mart. Also, quite a few years went by, at least five, between the closing of the mall K-Mart and the opening of the Barstow Road location. 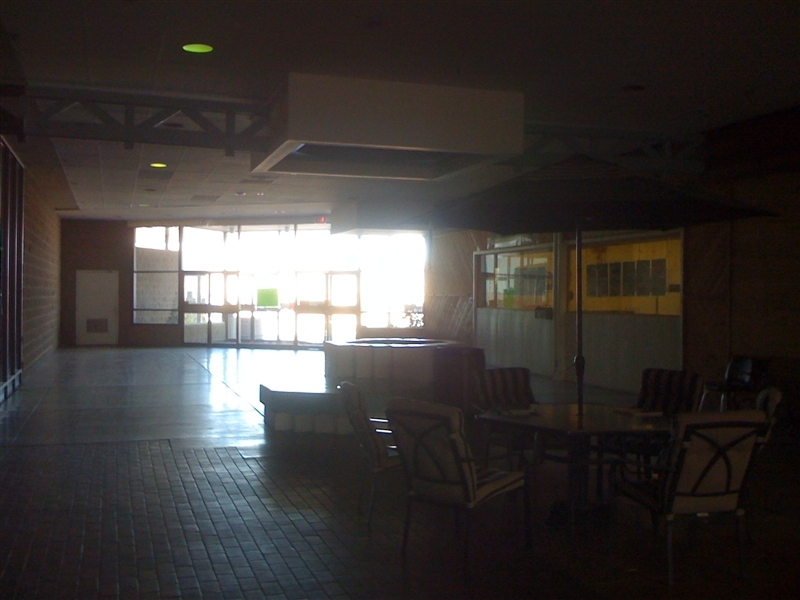 What killed the Barstow Mall? The city of Victorville started to grow as Barstow was shrinking. The Lenwood Road developments like the [now dead] Outlet Mall. It was already near dead when Wal-Mart opened in 1995. Wow! Did this ever bring back memories for me. I landed my first job in that mall back in 1984 at Regis salon I was 18 then. 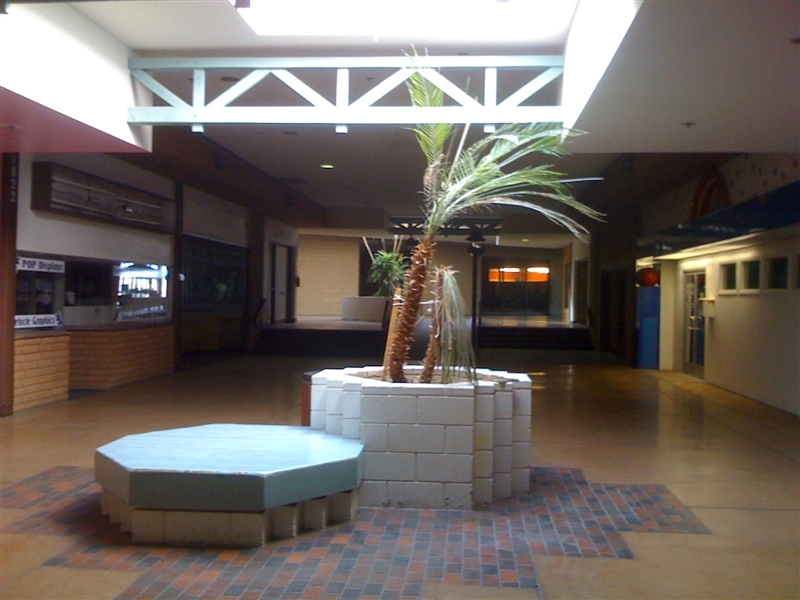 This mall was a the hang out place for teenagers. I remember Sears,Hotdog on a stick, Millers Outpost, Clothing dept called Rudes, a Mexican resturant. There was a big fabric store also at one time. Speaking of creepy, every Holloween every store would participate and dress up and they would give awards to the strore that would go all out and most did. Thanks for taking me down memory lane.I think a screenplay would be great for that place. 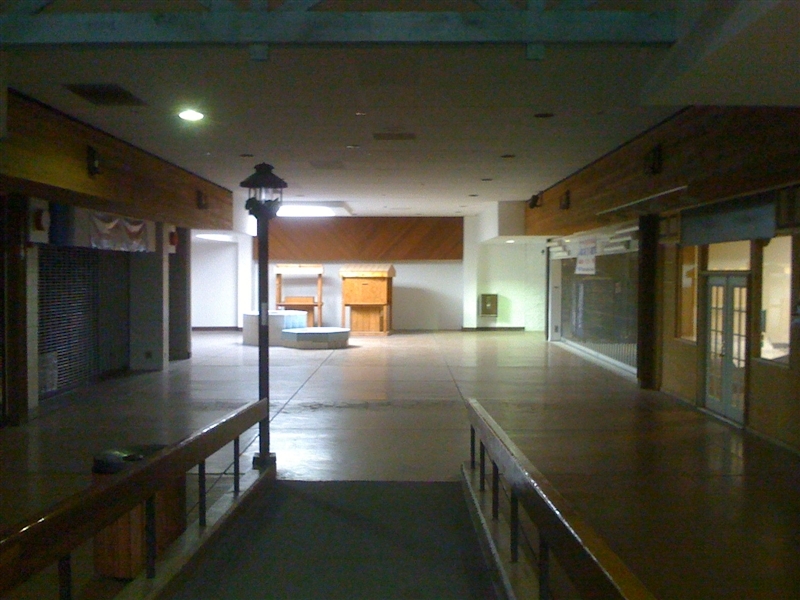 TT Group of San Jose plans to renovate the mall. PVL has the story today. Sorry, PVS has the story today. Dylan, I think th efolks that have made comments are only relating the history of this mall and their rememberances. I did not see anyone berate the community of Barstow but explain that Victorvilles’ business sector pulled local customers into their venues. I do hope for your community that the TT Group fulfills their promise to revitalize the Barstow Mall unlike the frequent promises by the Pyramid Group on the East Coast of our country. Cheers, jack. Found out a little more. Kmart pulled out sometime around 1993, and Sears was Pic ‘n Save before becoming Big Lots in 2002. It seems Big Lots was slated to close in 2003 but stayed open until 2006. ………….ok, how weird is this? 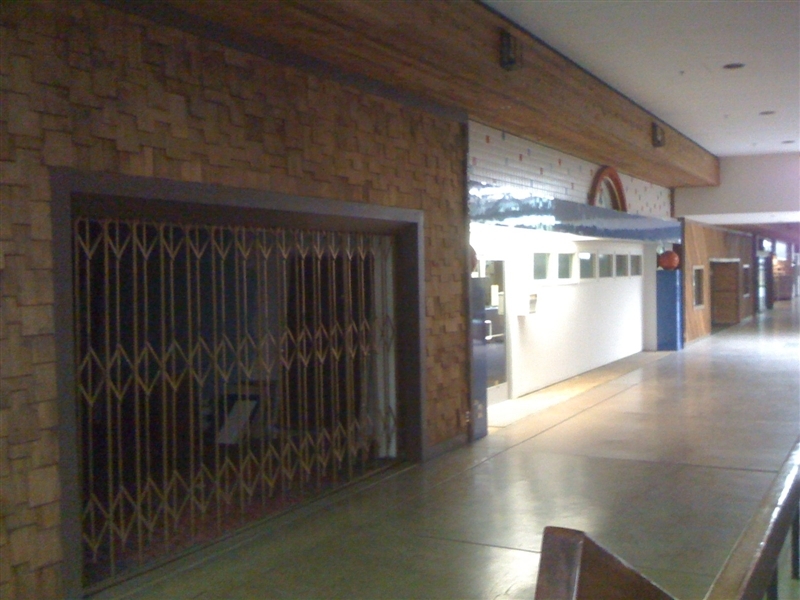 I work for a general contractor and we are bidding a project in May of 2009 that consists of renovating a portion of the (unbeknownst to me) infamous, Route 66, “Barstow Mall.” Looks life new life maybe coming to the mall! I jumped online to try and find the zip code for the mall and encountered this website. I’ve NEVER done a blog in my life, but couldn’t resist this one! ………you truly can find anything on the world wide web! i use to live in barstow. the mall is still there but nothin but the sports center and a music store is left. at one point there was a gym and a skate shop. but those are long gone. as well as the big lots. not to sure about the korean spot though. I worked at Kinney shoes in 1987 right after I got out of the Army and moved back to Barstow. After a WHOLE month of amazing the manager, Leonard Duran, I was informed that I had been CHOSEN to be a manager candidate with a very bright future in shoes. It took about one week to think the whole thing through and I ran screaming (ok, not literally) from there. I think I had seen a few episodes of Married with children that had just come out and realized I did NOT want to be Al Bundy. In my short time working there, I would eat those “southern dogs” from Hot-Dog-On-A-Stick (hotdogs with BBQ sauce) and roam through the mall and look at it’s many closed store fronts… I remember when that place opened in the mid 70’s. Excitement 🙂 Anyone else ever walk UNDER the mall through the drain culvert that went all the way to the other side of main street? Excellent! I worked at Kinney Shoes as well in 1986. Leonard fired me because I wasn’t ‘productive’ enough even though my commission was higher than his wife’s or another co-workers. Get rid of the guy who makes more, keep the guy who does worse. Tough lesson but there it is. The mall was THE place, Score was an awesome arcade. I also worked at Rude’s Department Store for a few months. Great pictorial! Huzzah! And yes Peter, I’ve been all under the mall on foot, ATC and bicycle, freaky but fun. Live in Central Calif, but if this place is still around, I’ll stop by on the way to Vegas. I dig these types of sites and odd ball history. Great stories on the shoe careers ha ha. Wow, I’ve been staring at these pictures for the past hour. I still can’t get over it. Me and my bro used to roam this concrete playground waiting for our mom’s shft to be done at the Kmart. So, how many of you kids went to Montara Elementary School? Hey Art, how’s the import/export business nowadays? Jerry wanted me to tell you that the Barstow mall belongs in the bizzaro world. Sorry for the late reply. The Import/Export business has been keeping me busy these days. So busy that I’ve been thinking about focusing more on the importing and less on the exporting. Me and gal Elaine got into a tiff the other day because she thinks I should still do both. 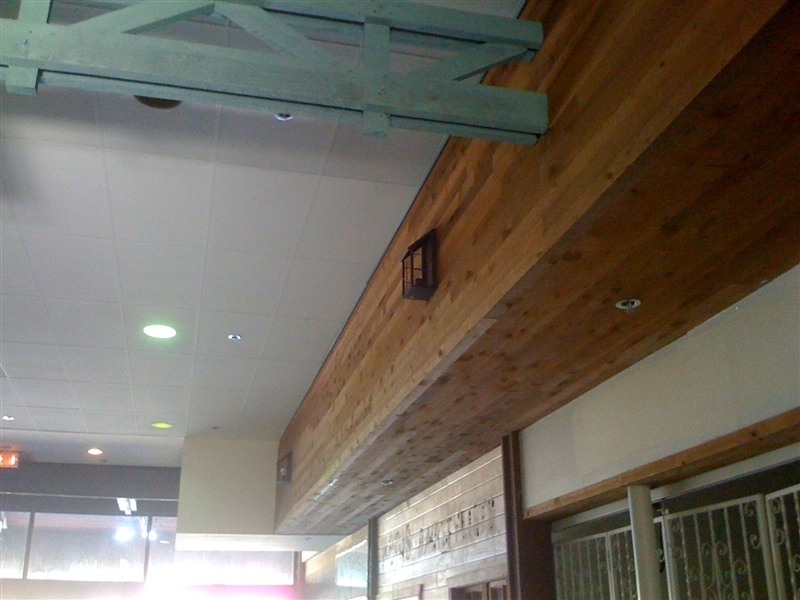 I love the wood work and the whole look of that mall. One store might have a brick facade, the other will have shingle siding. It is great seeing a unique 60s/70s mall in a small city. the mall is still open and working good with welfare in the sears end. 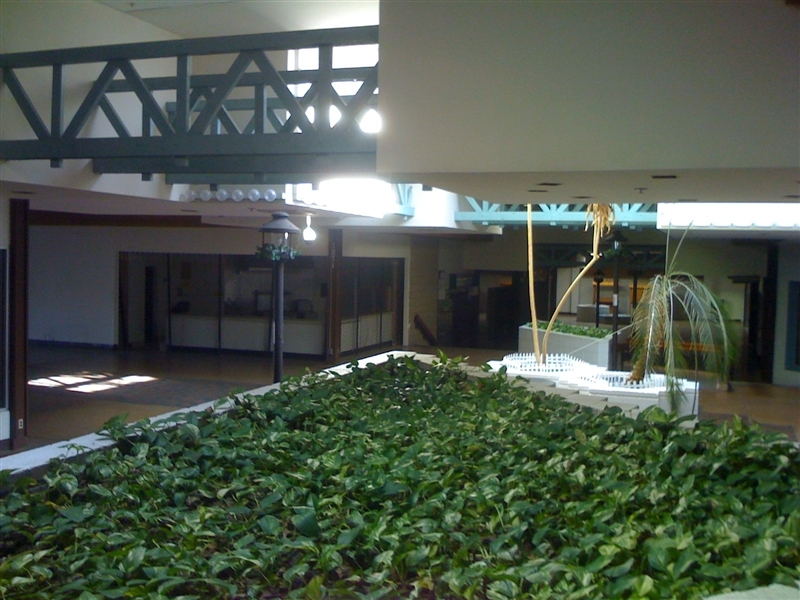 the county welfare office has relocated to the mall, in the old sears but i dont think theres anything else in this mall. 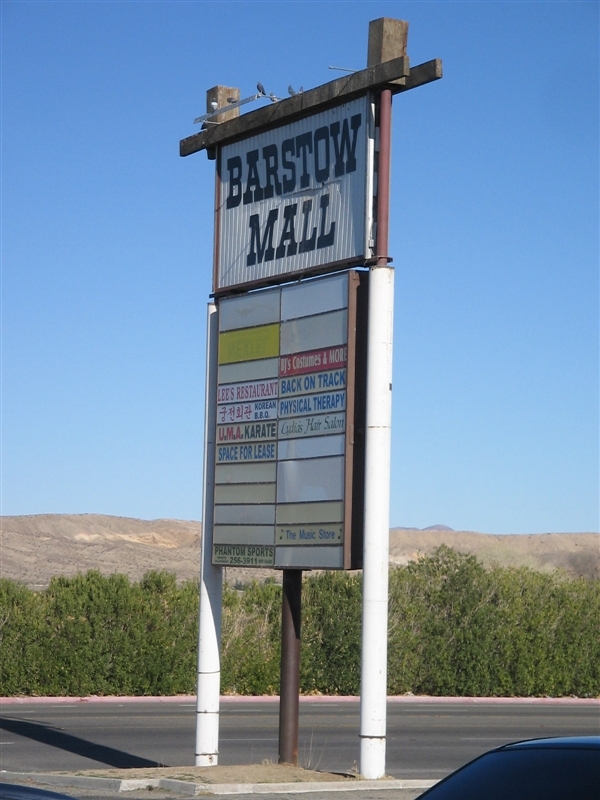 Just stopped in the Barstow mall – easily one of the MOST DEPRESSING places I have ever been in – and I have been in many places! All that is left is a thrift store, that was extremely thankful we spent $1.09 (with tax), a greasy food place, and a sporting goods store – with a “everything 50% off – going out of business sale” – and the County of San Bernadino offices next door. So sad, it is a very busy traffic area to/from Vegas/LA – could be an amazing place. I miss going to the Mall!!! Used to go every weekend…My girlfriend and I would hang out there all day long. And sometimes we would go during the week…I miss everyone!!! I am getting so home sick!!! Lived in Barstow from 1980-1986. 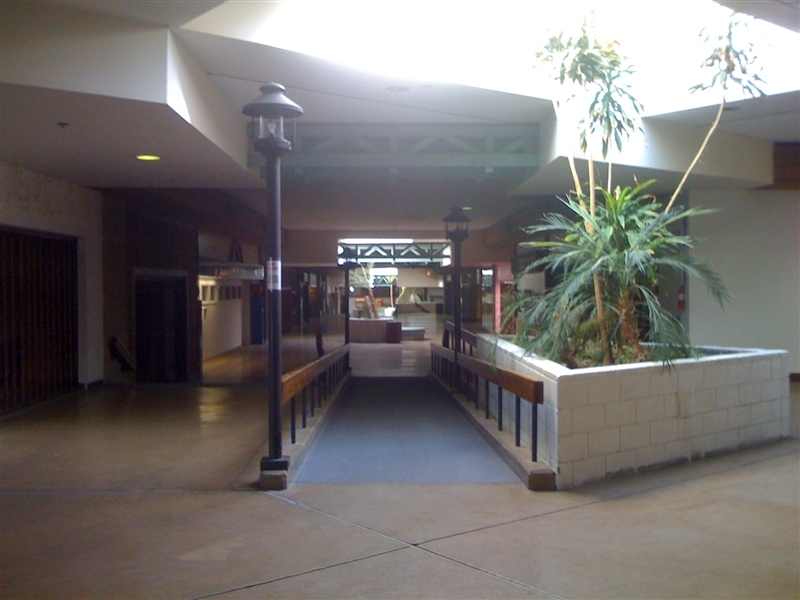 The mall was the spot to be in if you were a teenager. I remember an awesome breakdance performance from John Rubio and Miguel Armendariz back in 83. Mom worked for Sears and a gift shop across from the hair salon. Ds bootery was a great store. Shout out to Dario! Fond memories. Havent been back since 89. Wow! Thanks for the stroll down memory lane! I have visited the fabulous Barstow Mall in the last couple of months. I have gots to get me one of them fancy “renovation” contracts for a couple million because, other than the Social Services offices I can’t see where a single penny was spent on the mall proper. Not one single thing, not even a fake leaf of greenery or outdated lighting fixture has been changed since those pics above were taken. As of a couple months ago the tenants were Ye Olde Computer Shoppe (which sells…old computers), the sports merchandise store (which I assume stays in business selling uniforms and equipment to local teams), a thrift store that benefits an Armed Forces Assistance organization, a clothing store, an actual arcade (if you can believe that), a martial arts studio and I believe something else plus a kiosk in the center. The Social Services office on the left, a mexican restaurant and some sort of auto repair place at the end. Depressing, odd smelling place. The post about the growth of Victorville was spot on. The Wal-Mart a mile down the road couldn’t have helped at all, the outlet malls in Lenwood hurt as well. Hard to believe there were ever any of those other tenants in there. Wherehouse music? Really? Stunning. For those who haven’t visited Barstow recently, the Wal-Mart is about to become a SuperCenter, so any remaining Mom and Pops in the area as well as the overpriced supermarkets might as well start packing now. I was born in Barstow and remember when this mall was built. I remember shopping in K-Mart and Sears there. Sears was the “High End” store in Barstow. I can’t believe it’s still there after they built the factory outlets at Lenwood Road. Neat seeing it again though thanks for sharing.